Thieves-Giving Make + Take w/ Essential Oil Guru Jennifer Carver! This Make + Take was all things Thieves Essential Oil! We made Thieves Foaming Hand Soap and Mini Thieves Household Cleaner! We brunched on Pumpkin French Toast, fruit, Thieves Apple Cider, and Thieves infused coffee (aka one drop of Thieves Essential Oil in our French Press, go try it it’s so good)! 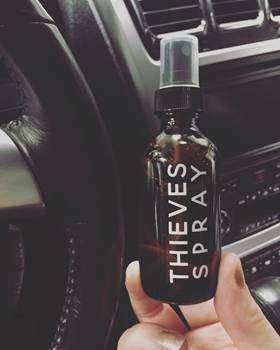 Thieves is one of our favorite oil blends! It is a unique Young Living blend that is a combination of Clove, Lemon, Cinnamon, Eucalyptus, and Rosemary essential oils. This blend was inspired by four 15th century French thieves who believed that wearing this special blend of botanicals provided them with protection while they were robbing the dying and the dead. Thieves Essential Oil helps support healthy immune function. We roll it on our feet at night and you’ll find us diffusing it quite a bit! When we feel something yucky coming on I’ll make a cup of tea with a drop of Thieves, Lemon, Copaiba, and honey. We also love doing a drop of Thieves in our coffee! So good! We love the Thieves line and the peace of mind Young Living’s chemical-free options provide for our home! Young Living offers such a variety of products in the Thieves line; Thieves Household Cleaner, Thieves Laundry Soap, Thieves Dish Soap, Thieves Automatic Dishwasher Soap, Thieves Fruit and Veggie Soak, Thieves Waterless Hand Purifier, Thieves Essential Oil Infused Cough Drops just to name a few! One of my favorite things about the Thieves line (besides that it actually works!) is that in the caution section on the back of the products it says “If swallowed, drink plenty of water to dilute”. It is such a comfort knowing that if a kiddo gets into it, it is safe. The Thieves line is plant based, free from all dyes, synthetic perfumes, SLS, SLES, formaldehyde, and phosphates. As we brunched, smelled all the yummy oils, and had girl time we went through and talked about all of the amazing products in the Thieves line! Everyone got one of the Thieves Booklets to follow along with! After we talked about all things Thieves we started making the goodies! First we made Mini Thieves Household Cleaner! I love having a mini cleaner in the car for spills and they are handy to keep in the bathroom for quick wipe downs! So versatile The Mini Thieves Household Cleaner are made with the Thieves Household Cleaner and water in a 2 oz. amber spray bottle! Thieves Household Cleaner and baking soda are all I clean with in our home! It works amazing! I cannot sing its praises enough! Next we made Thieves Foaming Hand Soap. It is so easy, cost effective, and it works so well without drying your hands out! It uses Dr. Bronner’s Castile Soap, Thieves Essential Oil, V-6 Enhanced Vegetable Oil Complex (you can use any carrier oil such as Vitamin E Oil, Almond Oil, or Fractionated Coconut Oil; learn more about carrier oils here), and water! Next month we will be making Body Butter and Bath Salts! Great pampering for the winter months and they would also make great gifts! Wishing everyone an amazing Thanksgiving and holiday season!